Came back from my night shift, meet my GF n headed down to CV to buy sandworms to find sandeel for my big game ltr on coz it has been a long time since i hunt for biggies, bt im so unlucky no sandworms bt only left pumpon sarong. No choice bt to juz take it. After getting all the stuff headed down to the spot. Haven tried this spot b4 bt ive tried the spots near it n the rusult is nt so bad. this spot is so tempting that i've been monitoring it for quite a while. 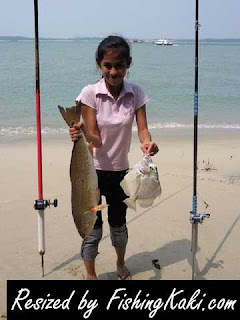 OTW thr met up wif 1 uncle that i'v noe for quite sometime when i fish there. He is a regular thr n cthce up wif the cr arnd there n it sounds great. So reach the spot at arnd 11am so told the uncle i'll be fishing further down abit to try this spot. 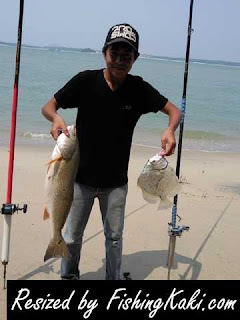 Once reach, set up my small game rod n cast it. I've to checked regularly coz there r alot of small fishes n crabs eating my bait. Started to find bait n cant hook even 1. Its my unlucky day coz its hard to get baitfish for that day wif pumpon even wif small hooks. As i was hunting for baitfish suddenly my rod had a hard pull. Wif the knowledge that Cik Kamsani had share wif me last time, managed to cnfrm that it is on n strike it. It was a though fight at 1st bt after 5-10 mins of fight managed to terminate it n its already near to shore. At 1st i thought it was a Big Duri bt as it come closer the fish is a Taiwango(i dnt noe how to spell the name bt it sounds like this). The similar fish like those at the pond bt this 1 is wild so its gold in colour. Tell my GF to hold my rod n i went down to gt. Its so heavy a fat. It weight arnd 2+ to 3 kg min. Then the uncle came by wif some passerby to tke alook at it n he gave me a rope to tie the fish n put it in the water to keep it alive as i forgot to bring my rope. 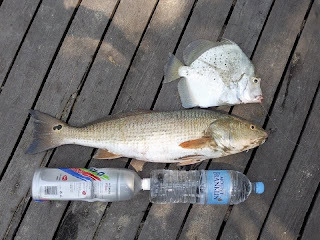 For all this while my GF requested that she want a live view of a Sicklefish been cought n abt 20mins after landing this fish, i landed a Sickfish. Only 3hr at the spot n its already enough for a trip. So decided to pck n take some photos for memories.